Note: Please consult our App Store listing for the most recent changelog. • Fixed a few memory leaks and problems with syncing photos. • We have integrated with 1Password and iCloud Keychain to automatically save and load your account information when logging in. 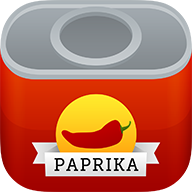 • We have enabled support for 32-bit devices, so Paprika 3 is now compatible with older iPads and iPhones. • We have collapsed the main menu on the 10.5" iPad Pro so it takes up less space. • We have added support for dragging and dropping menu items so you can re-order them or easily move them between days. • The ingredient scaler and grocery list will now process decimal numbers according to your locale. • Added back the clear pinned recipes button. • Added back the setting for the name of the Calendar that meals get exported to. • Added back the option to swipe from the left edge to bring up the navigation menu. • Fixed detection of times in certain languages such as German. • Fixed several issues with scaling and converting ingredients. • Fixed recipe difficulty not getting translated properly in certain languages. • Fixed the ability to swipe to delete a meal from the month view. • Fixed the ability to swipe to delete grocery items that belong to a particular recipe from the grocery list. • Fixed the sort order of meals that were originally created in version 2 and synced over. • Fixed many other potential crashes to improve the stability of the app. • Fixed an issue preventing the Safari extension from starting. • Fixed an issue with scaling metric measurements. • Fixed an issue with sorting recipes by most recent.